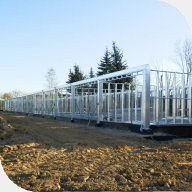 Houses – Light steel structures are ideally suited for the construction of houses, both single and multi-family. The steel skeleton is delivered directly to the construction site as prefabricated wall panels, floor beams and complete roof trusses. Installation is easy and fast due to low weight, usually does not require heavy lifting equipment. 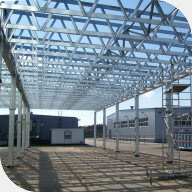 Warehouses – Produced by FRAME FACTORY light steel structures are suitable for building small warehouses with effective span up to 18 meters (or a multiple of that size). 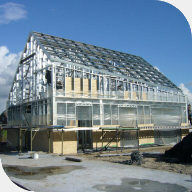 They are ideal as agricultural buildings, as well as garages or workshops. Depending on the purpose they can be suitably insulated and equipped with the necessary installations and external woodwork systems, including gates and rooflights. 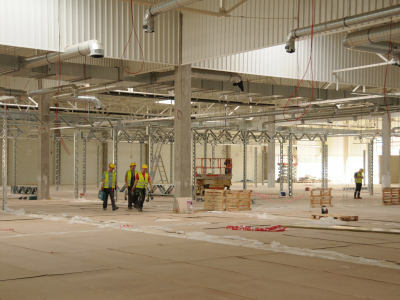 Internal space construction system – FRAME FACTORY is the producer of light steel constructions (LSC), who delivers directly to the construction site prefabricated wall panels, floor beams and complete roof trusses. Installation due to low weight is easy and fast, usually does not require heavy lifting equipment. Thanks to a numerically controlled machines and effective software, you can quickly design the required buildings and precisely prefabricate them, and then deliver to the destination.